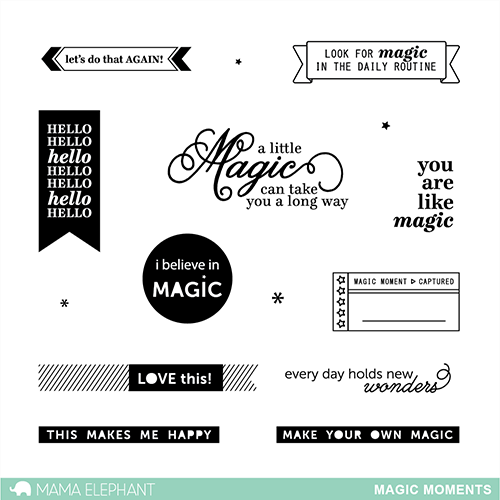 We're bringing back some graphic sentiments with Magic Moments. It's important to find joy and magic in our lives, focus on the positives. Magic Moments will help you convey those magical moments. This set will work for any occasion, it's quite fitting for cards, scrapbooking, or daily documentation! Inspiration just hit! I think we need to create a magical set of images -- perhaps casting happy spells on one another? What do you think, wouldn't that be fun? I used my favorite sentiment from the set and paired it with Bear Hugs... the finished card is one that is quite touching. The dark to light ombre watercoloring evokes a certain mood balanced by the suspending stars -- it creates quite a magical scene. I made sure to give the bears enough contrast, as if the stars are shining brightly, and magically upon them. Here's a closer look at the embossed sentiment. 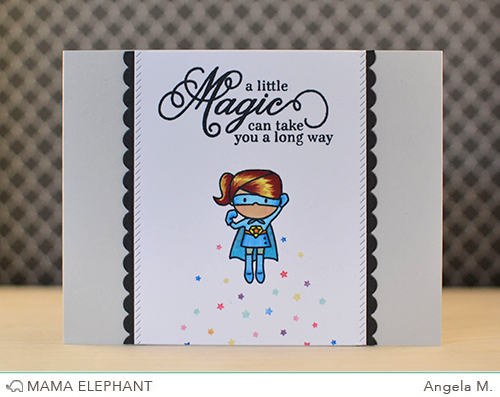 Angela paired a sentiment with one of the Tiny Heroes because all we need is a little of magic to bring the super hero out of us! Are we all ready for the Stampede? More projects and giveaways to come tomorrow! Very lovely, I love how well it goes with images from other stamp sets! Yes, please to images that are magical! I vote a bunny with a top hat, and unicorns and rainbows.